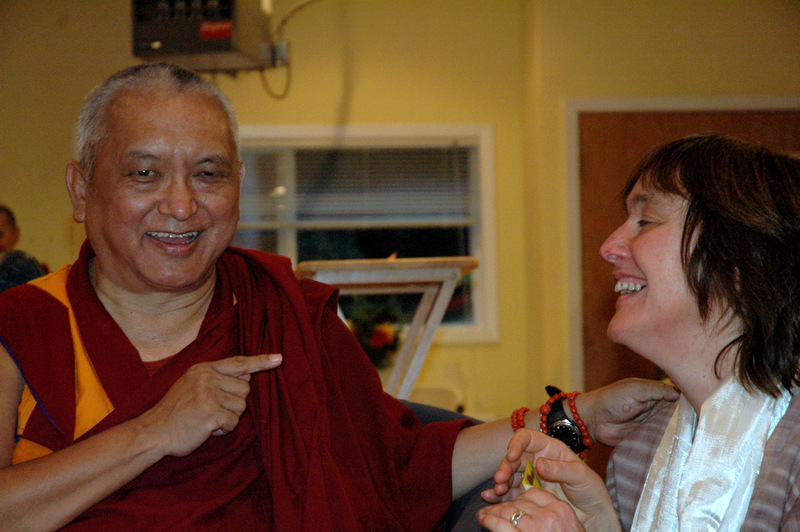 Lama Zopa Rinpoche and Alison Murdoch, October 2007. Photo courtesy of FDCW. After offering 10 years of service to the Foundation for Developing Compassion and Wisdom (FDCW), Alison Murdoch has stepped aside as director. FDCW is the international organization that promotes Universal Education for Compassion and Wisdom, which is a system of inner learning that enables children, young people and adults to lead a happy and meaningful life and to be of service to others. Universal Education, as it’s called for short, was a vision first articulated by Lama Yeshe nearly 40 years ago. During her time at the helm, Alison developed FDCW from a small group of volunteers working in her living room to an international organization with an office and a team of five staff, plus dozens of volunteers worldwide. Throughout, Alison relied on the advice of Lama Zopa Rinpoche and with his support, she obtained His Holiness the Dalai Lama’s blessing as FDCW’s patron. In addition, Alison secured funding and put in place good governance structures, ensuring a solid foundation for the organization’s future growth. In addition to obtaining funding and building the organization, Alison co-wrote the book 16 Guidelines for a Happy Life which became the basis for an FDCW-created program for developing empathy, compassion and resilience in daily life. Since 2007, FDCW has published 12,000 copies of the 16G books and the 16G website has received over 55,000 visitors from 190 countries. There have been 131 training courses on five continents and thousands of people around the world receive the newsletter. Under Alison’s watch, FDCW has held conferences, both international and regional, in various locations around the world. A thriving community has developed of people committed to practicing and sharing Universal Education for Compassion and Wisdom. In her role as director, she nourished relationships with FDCW’s recognized programs Creating Compassionate Cultures, Transformative Mindfulness Methods and The Potential Project. 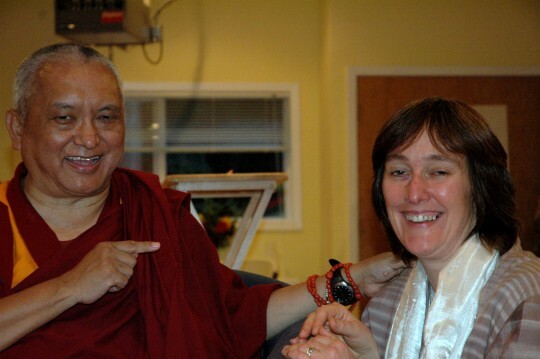 “In 2004, when Alison told me in France that Lama Zopa Rinpoche had asked her to lead Universal Education, I thought I already had an idea of Alison’s qualities due to her amazing work as director of Jamyang Buddhist Centre London. But in the 10 years since, she has astounded me. From humble beginnings – working alone at home – Alison has helped FDCW become known across the world. She has established a wide international support base and attracted sufficient funds to employ a small team developing innovative projects. “She has helped to build FDCW’s good name and professional standing and has been instrumental in establishing and maintaining many partnerships that will be important for the future. “Alison can be proud of what she brought to FDCW, of what she planted and of how she grew it. It is a job with many responsibilities, which she took very seriously, and she is the first to acknowledge that all mistakes were her own and all successes were a joint effort. “At times, the responsibility has been alarming – no safety net of infrastructure, core funding or support teams. There’s a comment I hear: ‘So you have people who do that?’ – meaning fundraising teams; marketing teams; HR teams; personnel teams; people to take minutes at meetings, etc. But no, Alison didn’t have ‘people who do that.’ Together with a small team, she covered everything. “Thanks to Alison, FDCW will keep evolving, will keep asking questions about what and how we do things and will look for the critical moments when we take a new idea seriously and find opportunities to further develop ourselves. To learn more about the work of the Foundation for Developing Compassion and Wisdom, visit www.compassionandwisdom.org.